How do we know the Bible is God’s Word? What is sin and where did it come from? How is Jesus fully God and fully man? What are spiritual gifts? When and how will Christ return? If you’ve asked questions like these, then “systematic theology” is no abstract term. It’s an approach to finding answers every Christian needs to know. Bible Doctrine takes a highly commended upper-level textbook on systematic theology and makes it accessible to the average reader. 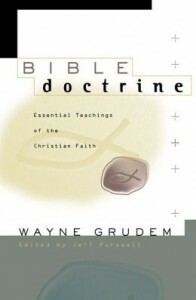 Abridged from Wayne Grudem’s award-winning Systematic Theology, Bible Doctrine covers the same essentials of the faith, giving you a firm grasp on seven key topics: The Doctrine of the Word of God The Doctrine of God The Doctrine of Man The Doctrine of Christ The Doctrine of the Application of Redemption The Doctrine of the Church The Doctrine of the Future Like Systematic Theology, this book is marked by its clarity, its strong scriptural emphasis, its thoroughness in scope and detail, and its treatment of such timely topics as spiritual warfare and the gifts of the Spirit. But you don’t need to have had several years of Bible school to reap the full benefits of Bible Doctrine. It’s easy to understand–and it’s packed with solid, biblical answers to your most important questions.